For many years while I was a student, there were only three method books available for improvisation study: Hymn Improvisation by Michele Johns, the two-volume Cours Complet d’improvisation a L’orgue by Marcel Dupré, and this title by Jan Bender. The Bender has been on my shelf for many years, but received little attention as my teachers have been primarily from the French school, relying upon their own material or the Dupré. The immediate distinction between this method and the others reviewed so far is the jump into counterpoint from the second chapter of the book. Chapter one gives the student the assignment to choose and memorize two hymn tunes, practicing them each hand alone, feet alone, and in octaves in different combinations. These melodies are to be memorized and practiced not only at the keyboard but through a visualization process where the student imagines a keyboard (or pedalboard). While I have used these techniques for repertoire, I found it very novel to apply them to improvisation. Haw many of us are studious enough in our improvisation practice and conscious enough of what we are improvising that we could sit at a chair and visualize it away from the keyboard? Treating the second hymn like the first would not be a new assignment, and yet we should be sure that solving only one problem is like doing nothing. Practice the given form … on 100 hymn tunes, and you will discover and learn a lot of important and interesting things.So the third assignment will be appropriate and new only insofar as the differences in melodies offer different possibilities of “fitting” a suitable counterpoint to them. 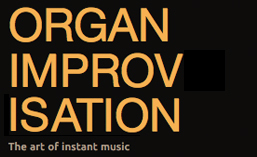 How often as improvisers do we do something once and then move on? After increasing the activity of the two-voice improvisations to primarily note against note, the next chapters add non-chord tones and other embellishments. Chapter six allows for the inclusion of an alto part, creating a three voice texture. This is as complicated as Bender wishes to advance in a book designed for beginners. The second part gives instructions for applying these techniques to the four-part texture of the standard hymn harmonization in order to create introductions. The final part suggests ways to work through the same material covered in the first part but using original material (i.e. not chorales). Though each chapter is filled with assignments for the student to complete, the end of the book offers an appendix of exercises. Considering one of the first exercises here is to play the C major scale in the left hand while playing an E major scale with the right, I think there are definitely some challenges presented here that we could all practice. While this is a small volume, it provides solid instruction in the material covered. It presents several ideas that I have not seen elsewhere and encourages the mental training side of improvisation in a way that I think everyone could utilize more often whether a beginning improviser or someone who has improvised for many years. This entry was posted in Book and tagged Book, Book review, Jan Bender, Method. Bookmark the permalink.